Many famous magicians have contributed something worthwhile to the art and history of magic. Canadian-born magician and illusionist Doug Henning most certainly was one of them. Henning (1947-2000) gave his first children’s magic shows at age 14 and became instantly popular. He obtained a University degree in psychology, and then won a Canadian theatrical grant of $4000 that enabled him to develop and build a stage television show called Spellbound. The show was so successful in Canada; in 1974 he took it to Broadway under a new title, ‘The Magic Show’ where I was privileged to see this exciting new show. It heralded a new era for stage magic that at the time was in the doldrums. Doug became almost like the Peter Pan of magic. His show was fresh and vibrant and full of music and colour. He became an innovator injecting a refreshingly new image of how a stage show could be presented. 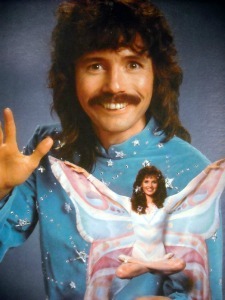 There are many lessons to be learnt from the magic of Doug Henning by the way he presented his whole show. 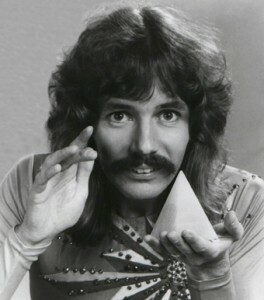 Doug Henning appeared on stage in brightly coloured costumes that was a far cry from the traditional more formal wear that earlier magicians appeared. His show incorporated rock music, comedy and illusion and animals, even utilising Harry Houdini’s famous Water Torture Escape and Metamorphosis illusions. He began to revolutionise what had been traditional stage magic for years. He had a wonderful charm and charisma, a mischievous smile that was just so infectious and endearing. His commercial success led to many big performances in Las Vegas and Lake Tahoe with numerous television appearances. He won many awards including an Emmy and was regularly voted for as the best variety act and appeared on the Johnny Carson Show. If Carson invited you onto his show it meant that you had truly reached the big time. Upon reflection, I distinctly remember him coming out on stage just after intermission now wearing a tee-shirt, jeans and sneakers, Gone were the brightly coloured costumes of the first half. He sat on the edge of the stage, quite relaxed and informal, where he entertained the audience with a selection of beautiful more intimate, smaller magic tricks. Although he had a huge mop of hair, it seemed to be in keeping with his warm personality. Some of the magic he did was poetic that included delightful, interactive routines with children who were in absolute awe of him. Children’s entertainers could learn a great lesson by watching his ‘You Tube’ videos. His magic tricks and the way he handled and interacted with children were classic lessons in themselves. Every child felt comfortable and like a star in his presence. In the early 1980’s Doug Henning was persuaded to bring his show back to Broadway and this time he titled it ‘Merlin’ and again enthralled theatre audiences, receiving five Tony nominations. Shortly after his popular Broadway run finished, he retired from the stage that was a great loss to magic. He sold 30 of his best illusions to David Copperfield and his menagerie of animals to private buyers. For the illusionist who had brought grand magic shows into the modern age, magicians found his decision to quit quite disappointing. During this time Henning became interested in politics and in transcendental meditation, a rather strange mix for a full time entertainer and spent some years in India studying with the Indian Guru Maharishi Mahesh Yogi, as did the famous Beatles. Doug Henning and the Yogi had drawn up plans to develop a massive theme park to be built near Niagara Falls. However due to Doug Henning’s untimely death in the year 2000, the project became unfulfilled. While I have always been a traditionalist with regard to what a magician should wear, I have to admit that Doug Henning introduced a far more informal style of wearing apparel that was distinctly casual and different. In the beginning this change was not well-received by most of the magic fraternity, like the breaking with tradition, but after watching him perform, however it gradually became an accepted style of dress. With so many street magicians performing these days, it is now very much more acceptable to perform in casual wear like tie dyed jeans. Having said that, I have seen some street buskers who were distinctly scruffy, so if you do decide to go Doug Henning’s route take a little care in how you will be perceived by those watching you. Viewing his performance videos on line may even suggest some novel ideas about choosing a colourful costume for yourself, to make you stand out. Doug Henning stood out with his magic tricks; he was very different and creative. Although he didn’t change magic drastically, he did introduce a different dimension to it as you can too. He is one of the many magicians in the history of magic who having made his mark, has left us a legacy to follow.